As always, thanks for these scans go out to Barry Pearl, author of The Essential Marvel Age Reference Project. Am I going to keep plugging his book every time I post the new "This Month in Marvel" page? I sure am! It's just that good. With this issue we see the introduction of Kraven the Hunter, and at the risk of sounding repetitive: The hits keep coming! 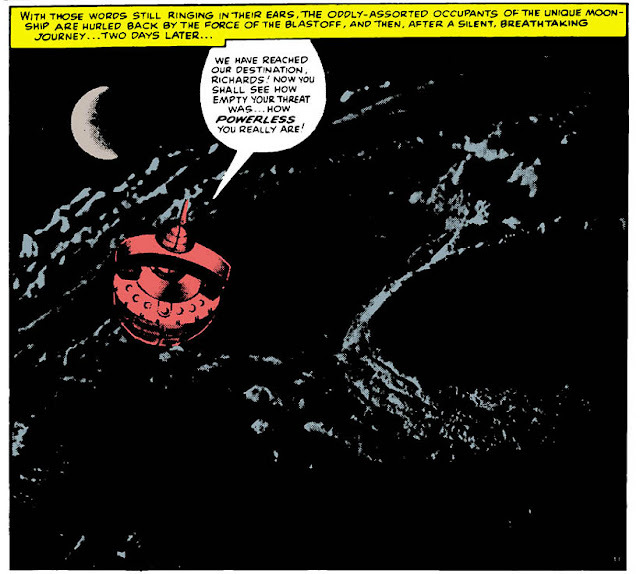 Seriously, it's nothing short of astounding how the pairing of Stan Lee and Steve Ditko on The Amazing Spider-Man has created classic villain after classic villain - foes who would be seen again and again and again, precisely because they work so well - with hardly a clunker in the bunch. (The sole exception would seem to be The Living Brain from #8.) 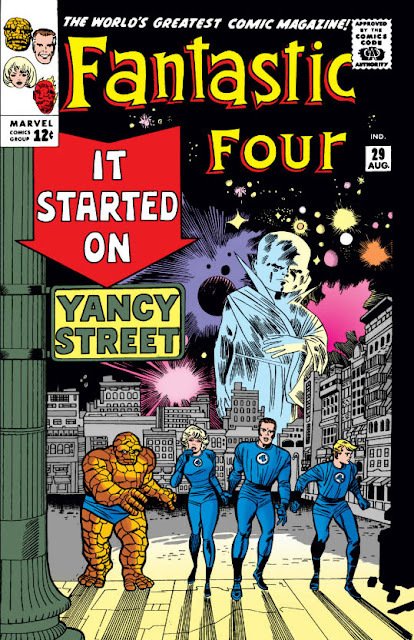 Compare this, on the other hand, to the indisputable hotbed of creativity that was Lee and Kirby's The Fantastic Four, but which nonetheless featured occasional bozos like The Miracle Man and Kurrgo, Master of Planet X (amongst genuinely great creations like Dr. Doom and the Skrulls). But then, I suppose we could write off The Living Brain, MM and Kurrgo as all fading relics of Marvel's earlier age; after all, even hokey supervillains like The Mad Thinker or The Red Ghost and his Super-Apes would be back time after time, in large part because they fit the requirements of the new Marvel supervillain so very well. So they're not even trying to hide their source of inspiration. 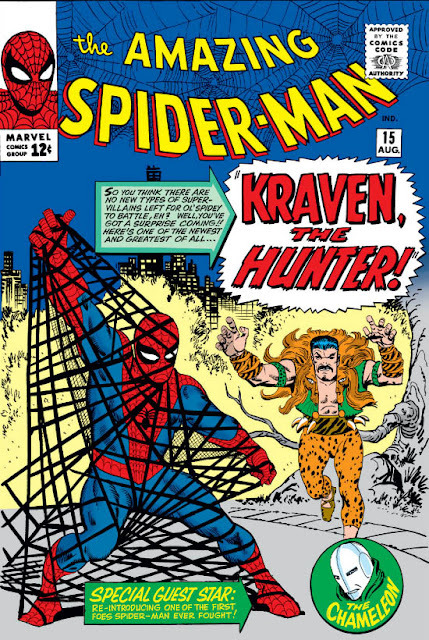 In fact, one thing that makes Kraven so great, as a character, is the directness of Ditko's visual design: With a single glance, from the leopard-skin leggings to the lion-head vest, you already have an idea who this guy is - and the cover splash sobriquet, "Kraven, the Hunter! ", clears up any ambiguity. The villain who is a ruthless hunter of men is, of course, a classic literary trope, most famously in Richard Cornell's short story "The Most Dangerous Game". It's a fascinating approach, because for once Spidey isn't being targeted so the villain can make a name for himself, or because Spidey got in the way of his crime, or for revenge - but just because he can. Which makes the villain legitimately scary, in a very serial-killer way. connected than this first meeting would have us believe! become quite a force in Peter's life. As new villains go, Kraven's quite a success! Rather than being something as simple as a flying thief, he's got several powers and abilities that make him quite a challenging foe: He's an expert at tracking his prey, for instance, and a master of hand-to-hand combat. One secret potion gives him his enormous strength, and another is used to incapacitate Parker for a full day, giving our hero nausea and the shakes. And he's got mechanical aids too, like his special manacles that not only clamp the arm and leg together, but incorporate a ringing bell in case the prey tries to escape. He's a well-thought-out baddie, and Lee & Ditko know it - which is why he'll be back not in some number of months, as you'd expect, but rather in just a few weeks...! Does anyone else find that last bit of dialogue out of character for Spidey? Could Stan have thought he was penning a narrative caption box?